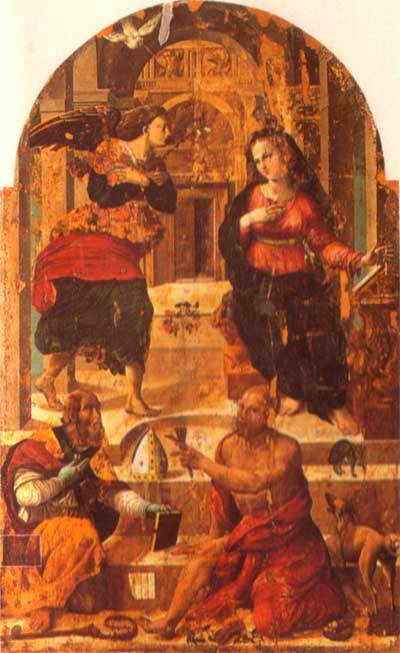 The title block at the lower left side bears the names of two authors: Papacello from Cortona, pupil of Luca Signorelli, and Vittore Cirelli who probably came from Montone and is recorded from 1532 to 1552. This piece comes from the Church of St. Fedele, as indicated by the image of the saint himself, who is represented with the Bishop’s mitre and pastoral staff. St. Lazzaro, holding the little hammer used by lepers to warn people of their presence, is the protector against contagious diseases along with St. Rocco.